Stories For Hope is led by Patricia Pasick Ph.D, a psychologist from Ann Arbor, Michigan. She works with a team from the University of Michigan and local NGOs in Rwanda. Here are excerpts from the organisation’s website. Stories for Hope, founded in 2008, is a storytelling project to help young Rwandans overcome a violent legacy. Many of their lives were ruptured in the 1994 genocide. Their remaining elders are quiet, fearing new grief or the spark of revenge. Lots of young women and men have been left as orphans, without knowing the important stories of where they come from. They need access to the past, without having to repeat it. To benefit peace, unity, and recovery, we host and help with dialogues between young story-seekers, and their chosen elders. These may be adoptive parents, mentors, aunts & uncles, elder siblings, or widowed parents. Conversations reveal untold family and cultural stories. But, to carry young people to the brink of hope, elders are encouraged to include accounts of resilience and strength. “A child who does not talk with the father can never know what was said by the grandfather. The primary mission of Stories For Hope is to promote non-violence, healing, and reconciliation, among youth whose families were ruptured in the 1994 genocide. By re-catalyzing intergenerational storytelling, and building capacity for the country to sustain this time-honored cultural practice, we hope to interrupt patterns of violence across many generations, and help re-build a more positive legacy for the newest generation of young leaders. A second mission is to assist Rwanda to build a digital archive of oral histories which capture the essence of Rwandan values and culture, and the strengths and hopes of its people. Sharing stories about the past is crucial to a nation’s post-conflict recovery and encourages the well-being of its survivors, citizens, and the next generation. A personal story about the past that is truthful and intended to be helpful, one which includes non-violent examples of how individuals have survived using their strengths and cultural values. 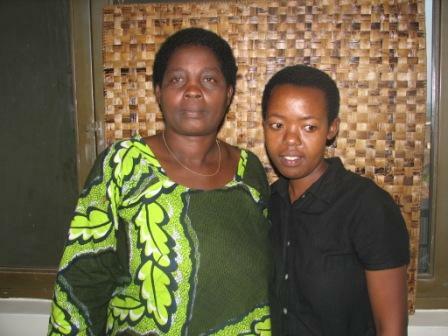 Here you can read about the story of Mukarurangwa Judith and Karangwa Nadia. In native language, elders are encouraged to volunteer stories to young people about the personal pasts. The stories can be about family, community, refugee life, or Rwandan culture, and about any era in the past. Youth are invited to ask questions that help them understand more about the past. Many wish to know about their families during the periods of ethnic strife, and violence. Facilitators are trained to ask what qualities of heart, mind, and spirit sustained their surviving elders, then and now? What has helped them to work against the effects of both conflict and poverty on their day to day lives? What within Rwandan culture taught them about how to best live, and love? In information sessions, youth are encouraged to prepare questions for their elders, guardians, or mentors, while elders are instructed in why it’s important to tell important stories from the past, including those which inspire hope. At the scheduled private recording session, participants are briefed again, then a facilitator helps tell stories and ask questions, for as long as an hour. The facilitator also audio records the session. Each pair is debriefed after the session and can ask for extra support, if needed, by a trained counselor. Every person leaves with a CD of the conversation, a CD player, and a framed photo. All are invited to have their stories posted on an archival public Website. Participants are reimbursed for transport, and followed up three, six, and/or nine months later.